Wolfmeier Guitars take our money already! 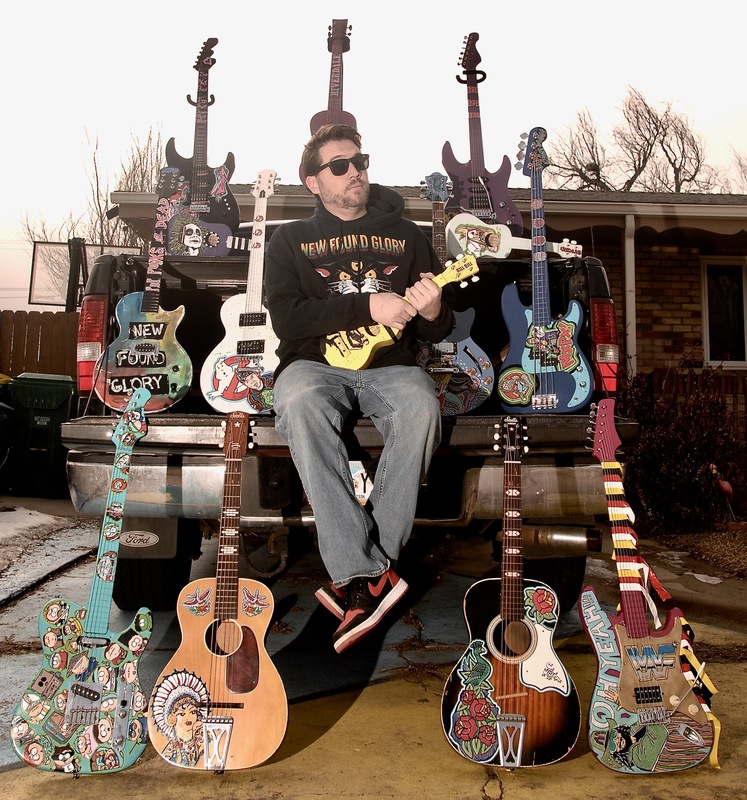 When we first saw what this crazy dude is painting on instruments we knew we had to interview him. 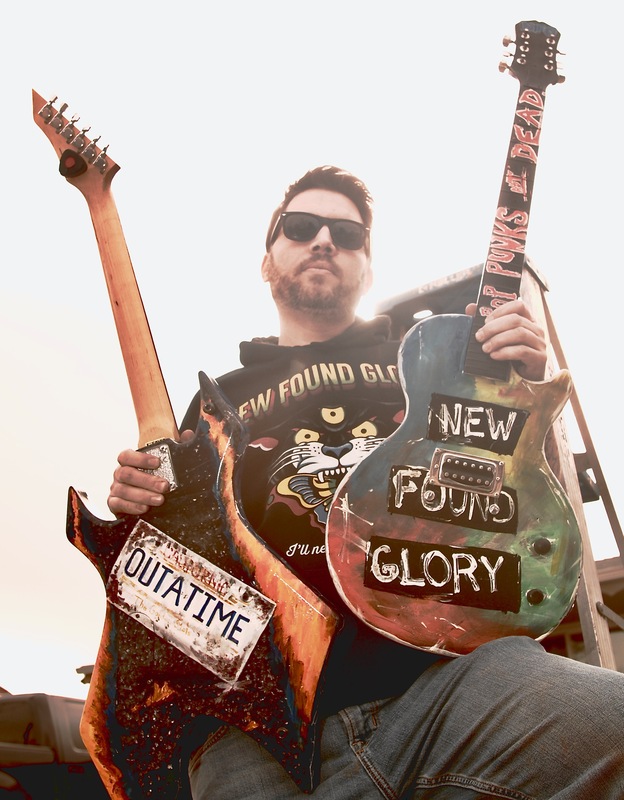 Nerd, punk, retro, pop culture it’s all done at Wolfmeier Guitars. Here’s WG’s head honcho Patrick Wolfmeier. 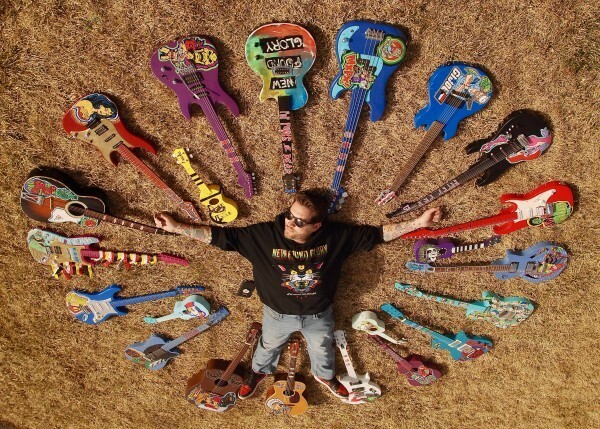 What made you switch from playing in bands to creating guitar art? I’ve actually been at this as a hobby since I was a teenager and have had a couple good series with some different artists, but artists are inconsistent and don’t believe in time. So I decided to venture on my own and do the entire process solo. 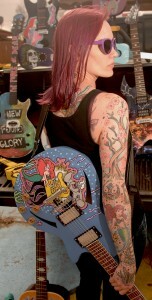 In the last year I’ve devoted a lot more time and energy into my guitars, and have turned out some wild stuff so far. How would you describe the type of art that you do to someone who thinks you’re nuts? To each their own, haha, I feel like my projects span quite a wide range of tastes and purposes. I can add art to anything really so a regular player can convert his regular guitar into a spectacle worth seeing and talking about. I also create projects that overhaul any guitars I find that are already good players. The third is my non-working wall pieces. Not to sound sappy, but too many guitars are tossed aside once they can’t be played any longer, and I give those guitars new life. Not everyone can play guitar but most people love the guitar and what it represents. Fame, Fortune, freedom and the ability to speak to the world without any language barrier. What are some of the biggest obstacles of what you do? How do you decide what subject to paint next? My creative process on this is pretty scatterbrained, but it usually falls into one of four categories. One is commission or a gift. 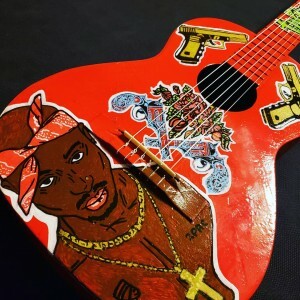 Those guitars I really go out of my way to try and add a personal touch or something that the customer will really relate to. Definitely trying to get the wow factor for the recipient. 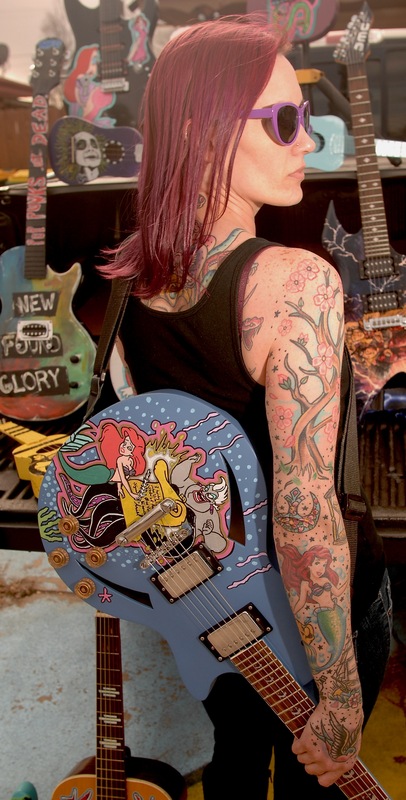 Number two is trying to match a theme to a crazy guitar body style like using a warlock themed for Elvira or a dot or Casino hollow-body for my rancid tribute guitar (didn’t have a Gretch to paint). Number three is honoring bands and musicians that have inspired me in my life. 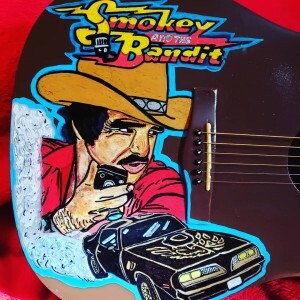 And the fourth is theme in the guitar in some pop culture reference that I’m into or that helps me along my path in childhood. What is the actual process of painting your pieces? And are they durable enough for performance or wall hanging only? What have been some of your favorite creations and what ideas do you have lined up for the future? I have a couple of favorites actually. I recently did a commission-based for a customer who wanted it themed after the Queen album News of the World. It turned out pretty killer, robot killing the band on the body and “We Will Rock You” up the neck. I was able to match the base paint from the album to the base paint on the base almost perfectly. 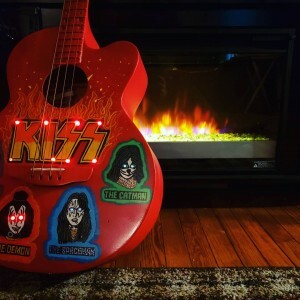 I also recently freshened up a friend’s acoustic Bass by painting it fire engine red and doing a KISS theme. 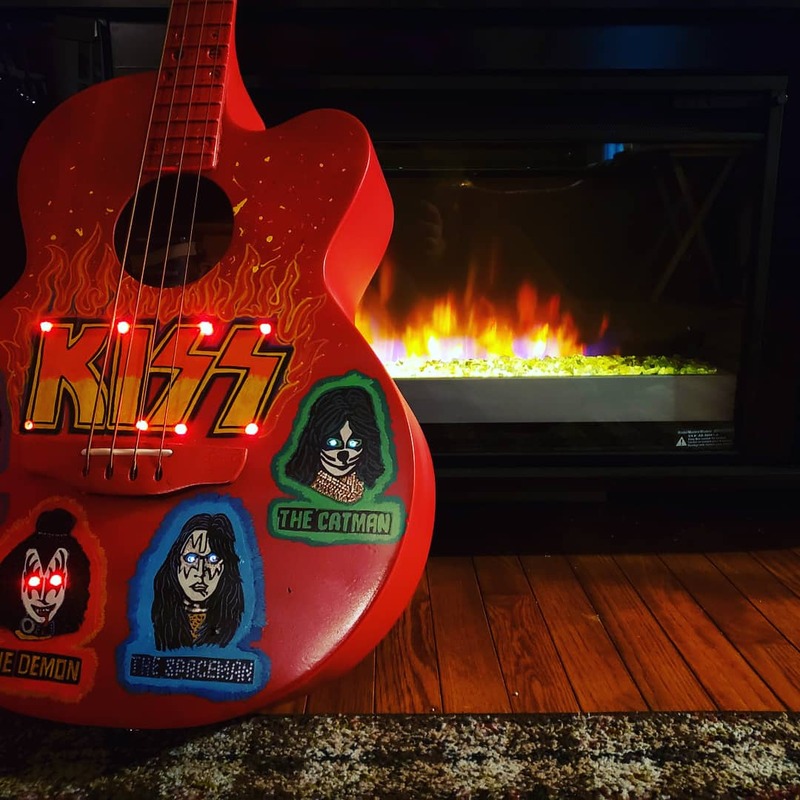 All four band member faces on the front as well as the classic KISS logo surrounded in flames, oh yeah and LED lights in the KISS logo as well as in the eyes of the band members, pretty ridiculous and unique. I’m a little secretive about future projects but I can say I have a guns and roses peace in the works as well as thinking of Stranger Things and Michael Jackson’s “Smooth Criminal”. Do you take commissions? How does that work? Will you only paint on string instruments? Do you ship? You pull from a lot of different realms of the pop culture world. What are some of your favorite genres to cover in your art? As a musician are your chops still solid? Will you be writing and performing any more original music? I continue to write on a pretty regular basis. I have toyed with playing a couple of acoustic shows and maybe a crazy cover show with all of my musical friends. With my writing I’m leaning away from performance and looking to convert into pure songwriting. Offering up my tunes to bands in need of music or interested in what I’ve written. What are your WG goals for 2019 and beyond? If you have anything else you would like to add please do so.